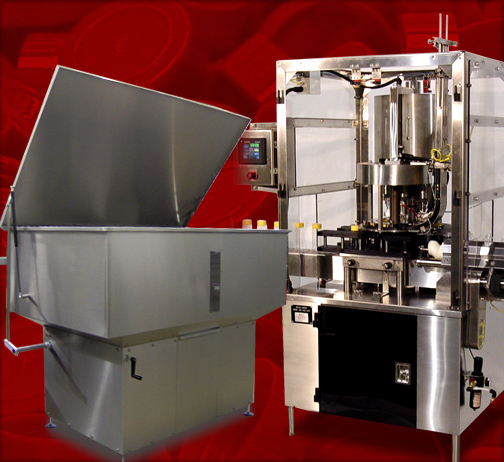 Dillin Capping Systems designs, engineers, manufactures, and services straight line and rotary cappers for vacuum (wet or dry) and non-vacuum applications. We also offer high-performance capping heads with magnetic clutches, custom- designed bottle handling parts, and other special purpose equipment for a variety of applications. For example, we provide technology and components for the bottling of baby formula in glass or plastic bottles. We also make cap sorters, pneumatic parts feeders, cap blowers, incremental torque gauges, in-line cocked cap detectors and dud detectors, and other specialized items of equipment related to the capping process.